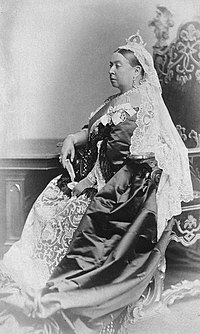 Queen Victoria, after whom the Victorian period is named. The Victorian era of the United Kingdom was a time of Queen Victoria's rule from 1837 to 1901. This time was very prosperous for the British people. Trade was at its best. A well educated middle class ruled the country and the British Empire. Other countries also prospered but Britain became the greatest great power. The Industrial Revolution continued to increase productivity and prosperity, especially in the middle and later parts of Victoria's reign. Making iron and steel was a basic industry. The furnaces were fired with coal. Shipbuilding was a major industry. Canals and steam railways connected all parts of the country, and British steamships connected the world. Cotton and wool were made into cloth and exported. Ceramics were also a major industry. One important change in the Victorian era was the making of the sewage system in London. In 1829 photography was invented. Gas lighting was important too. Streetlights became common first, followed by lights in public buildings and at home. In the 1880s people began making power stations and distribution systems to feed the new electric lightbulbs. Britain began ruling its trading colonies in Africa, Asia, and the Caribbean. The British Empire now extended all over the world. It used new technologies like the railways and electric telegraph to communicate across these regions. Many British citizens moved to the colonies to make their fortune. Industrialisation brought with it a rapidly growing middle class. They were not aristocrats and landowners, but on the other hand they were not unskilled workers. They were the people who created, managed and ran the new industrial factories. In the Victorian era, the middle class people owned their own houses. The family home often included three generations. The concept of "privacy" became a mark of the middle class life. What went on in those homes was the themes of many mid-century novelists. The printing press became faster in the nineteenth century and paper was cheaper too. The "taxes on knowledge" on newspapers and printed advertisements were lifted. This made magazines and newspapers cheaper. The government tried to improve literacy rates by starting schools for the poor. More books were written for, and read by, the newly educated middle classes. More theatres opened in London. Orchestras and symphonies played, and operas were widely attended. Gambling at cards and new casinos became popular during the period. In the middle of the 19th century saw The Great Exhibition of 1851, the first World's Fair, and showed the greatest creations of the century. ↑ Swisher, Clarice (ed) 2000. Victorian England. San Diego, CA : Greenhaven Press. ↑ A. Wohl 1978. The Victorian family: structure and stresses. London: Palgrave Macmillan. ↑ "What was known as a 'Tax on Knowledge'?". www.historyhouse.co.uk. Retrieved 2017-09-13. ↑ "The 1870 Education Act". UK Parliament. Retrieved 2017-09-13. This page was last changed on 2 April 2019, at 06:26.